While housing markets across the country are recovering from the deepest throes of the foreclosure crisis, others are just stumbling into it -- and they aren't exactly the places you'd expect. States like Maryland, Oregon and New Jersey, which maintained relatively stable markets after the housing bubble popped, saw new foreclosure filings climb by double- and triple-digit percentages in July, according to RealtyTrac. 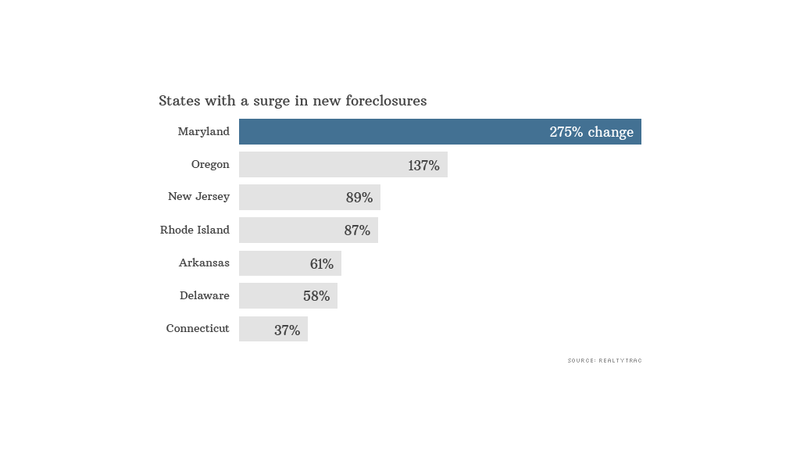 In Maryland, for example, new foreclosure filings skyrocketed 275% compared with a year earlier. When it came to overall foreclosure activity, including default notices, scheduled auctions and bank repossessions, the state had the second highest foreclosure rate in the nation, after default-riddled Florida. Oregon saw new foreclosure filings surge 137% and New Jersey's foreclosure starts spiked 89% year-over-year. So what gives? In many of these cases, early government intervention aimed at helping these markets is now coming back to haunt them, says Daren Blomquist, RealtyTrac's spokesman. "Foreclosures are continuing to boil over in a select group of markets where state legislation and court rulings kept a lid on foreclosure activity during the worst of the housing crisis," he said. Take the D.C. metro area, where the District of Columbia converges with the suburban counties of Virginia and Maryland. Foreclosure filings in both D.C. and the Virginia suburbs of Fairfax and Arlington are down significantly year-over-year, while in Maryland's nearby Frederick and Montgomery counties, the rate of new foreclosures is skyrocketing. "That tells me that the difference has not much to do with the underlying fundamentals of the housing market but by the way the crisis was handled," said Blomquist. After the housing bubble popped, Virginia's government didn't try to stop many of the defaulting loans from working their way through foreclosure process. While the hit was painful at first -- by the end of 2008, the state had the 10th highest foreclosure rate in the nation -- the market has gotten back on its feet more quickly. Meanwhile in Maryland, an aggressive effort by the state to make sure all foreclosures were handled properly during the housing crisis saved a lot of people's homes but it also postponed a lot of inevitable foreclosures, according to Blomquist. Now the banks are catching up. Another key difference: Maryland is a judicial state, meaning all foreclosures must be approved by the courts which inevitably slows the process. In Virginia, a non-judicial state, trustees arrange to repossess homes on their own. Among some of the states that saw the largest spikes in foreclosures last month, New Jersey and Rhode Island are judicial states. Oregon is classified as a non-judicial state, but that status changed for many mortgages in the wake of the robo-signing scandal, which revealed that banks were playing fast and loose with foreclosure paperwork. Oregon then insisted that foreclosures on mortgages that had gone into an electronic tracking system called the Mortgage Electronic Registration System (MERS), which the robo-signing abuses were centered around, had to be approved by a court. Nationwide, RealtyTrac reported a 6% increase in new foreclosure notices in July. That helped push overall foreclosure filings 2% higher year-over-year. But there were some bright spots: States like California, Illinois, Pennsylvania and Georgia are seeing foreclosure filings that are nearing levels not seen since before the housing bust. "The foreclosure boil-over markets are becoming fewer and farther between," said Blomquist.